SureCrete’s SureSeal ColorTec Acrylic™ is an exterior concrete paint that can be used for coloring driveway and sidewalk that require a high traffic coating. 30 standard colors include gray, silver, white, red, brown and tan. Surecrete’s outdoor colored concrete surface sealer can also be color-matched to virtually any color in 1 and 5-gallon Low-VOC options. 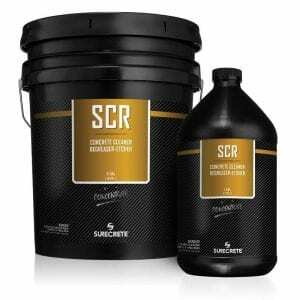 Avalible in 1 and 5 gallon options, SureCrete’s Solvent-Based Low VOC Concrete Sealer was formulated to solve the typical problems associated with colored acrylic coatings in the decorative concrete industry – delamination in environments with constant freeze and thaw cycles during the spring and fall and pigment instability due to UV exposure. Pigmented SBL can eliminate these problems for both contractors and homeowners, and is able to do so at a lower VOC rating than typical colored acrylic coatings. This helps to keep your projects green, eco-friendly and generating LEED points to help secure large architecturally specified projects. 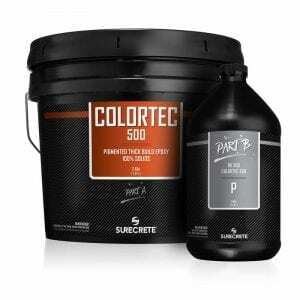 SureCrete’s tinting system is head and shoulders above the typical colored concrete sealed for pool decks and driveways paint coatings systems available in today’s market. The tints used by SureCrete’s pigmentation station are much more durable and exceedingly more UV resistant than even the most costly of competitive products. With tints like these, your finished low-VOC pigmented acrylic exterior paint coating system will last longer than a normal acrylic sealer ever could, with the color retaining more of it’s vibrancy over an extended exposure to UV light and the outdoor elements. Not only are these tints more durable and UV-stable than typical pigmented concrete sealers, but the wide array of available colors provide a much larger variety available than other low-VOC colored acrylic concrete coatings. 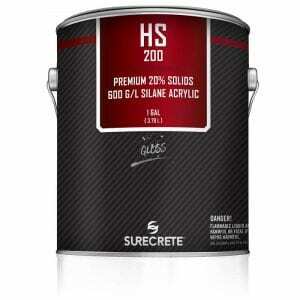 Pigmented SBL is available in more than 200 standard colors for concrete floors. If that weren’t enough, now, with the power of the tinting station, all these colors and more are available the same day you place your order at any of our ON DEMAND locations throughout the United States and Canada. We can even match your color palette from a different manufacturer such as Sherwin-Williams, DuPont, Baer, Valspar or Scott Paints. Or, if you’re looking for that truly fabulous and different design palette, we can also perform themed color matching such as University colors, Professional sports teams or perhaps even your favorite movie or television show! Just come in and try Pigmented SBL for yourself, we’re confident that you won’t be disappointed! 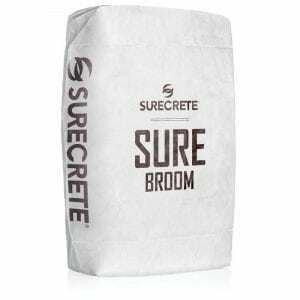 Watch video concrete applications. 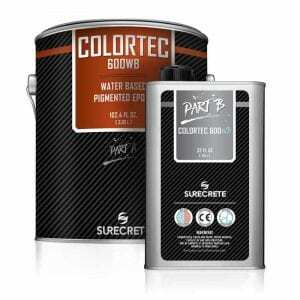 High gloss colored concrete sealer solvent based single-component, 30% acrylic solids, 600 g/L, color sealer developed for SureCrete’s overlays or any cement based product. 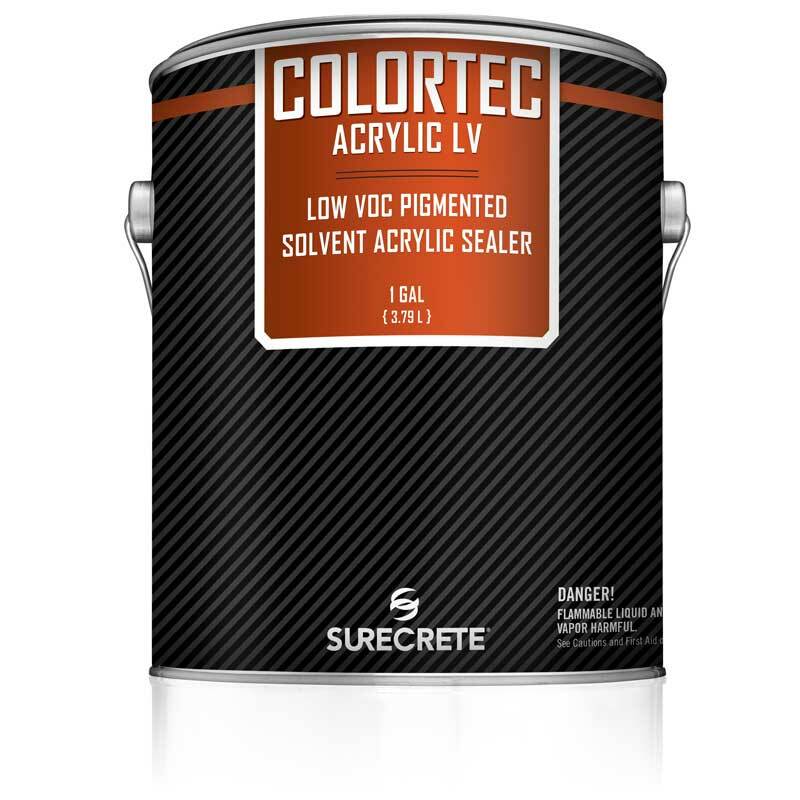 Available in one and five-gallon option, our colored concrete sealer is vapor permeable, yet reduces the penetration of fluids into the surface. 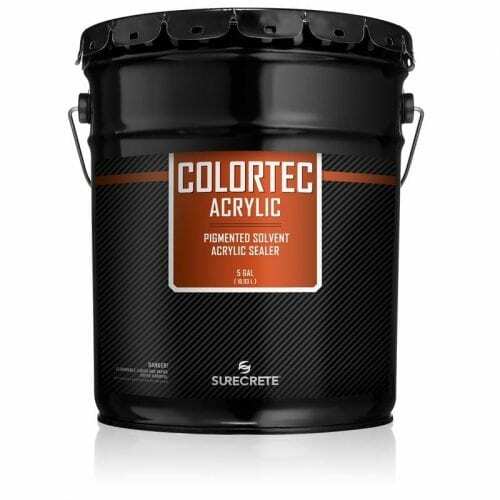 Pigmented solvent-based will enhance the beauty, improve stain and abrasion resistance for driveways, garage floors, patios, walkways, pool decks, stucco, and concrete block. Pigments are specifically formulated for UV stability, will not blush, and retain long lasting gloss retention. SureCrete’s Pigmented Solvent-Based Acrylic sealer was developed and designed with a few, very specific properties in mind. Over the years, many applicators have had issues with typical pigmented acrylic sealers losing gloss sheen, having low abrasion resistance, severely lacking in UV stability and increased delamination in freeze – thaw environments. The SureSeal Pigmented Acrylic Sealer line of products was specifically designed to deal with these typical application issues in the colored concrete coating industry. 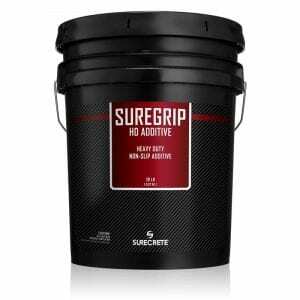 Pigmented SB is the most cost-effective product from this line. At a marginal price per square foot, Pigmented SB can provide your exterior patio or outdoor commercial pool deck area the sufficient protection it needs without the worry of discoloration or delamination inherent in similar products. We guarantee you’ll be impressed with the results. 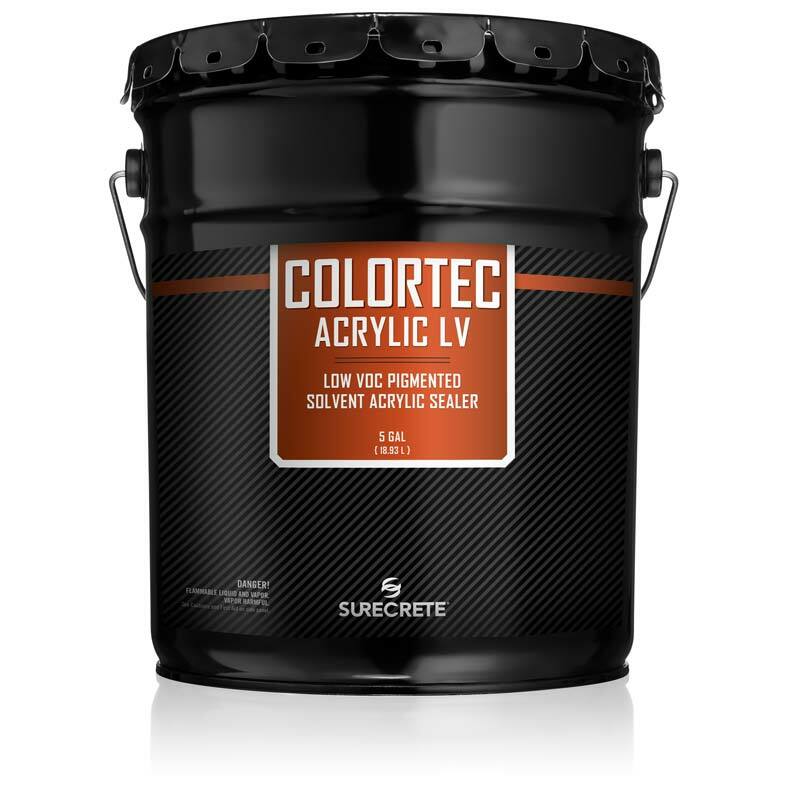 How to Apply Colored Concrete Paint and Acrylic Sealer? The pigmented acrylic sealer can be applied by roller, airless sprayer, and pump-up sprayer. Whatever your application technique, make sure to apply thin, even coats over your surface. Regardless of initial application method, make sure to avoid seams in your application areas by backrolling product as necessary.